(Sorry for the slightly blurry pic, I snapped it in a rush this morning.) 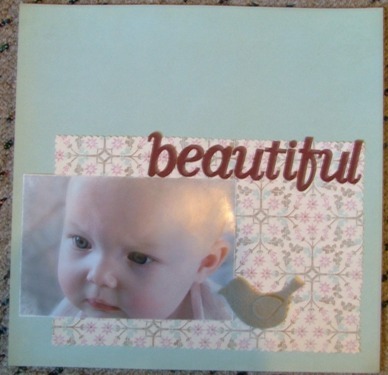 This is my first entry into a local scrapbook store’s competition. I love doing challenges: they keep me on my toes creatively. This one was to use 1 picture, 1 piece of cardstock, 1 piece of patterned paper, 1 word, and 1 embellishment. Talk about tough. After moving things around for a while, I love how this turned out. When I get the page back, I should show you how an accident resulted in a much better layout than I had originally gone with. Sometimes it’s a happy accident, sometimes it’s not. I was inspired by some recent posts of Ali’s about celebrations of daily life: she has been documenting some "little" victories- Simon learning to write his name, for instance. Of course, for an autistic kiddo, that "small" victory is a huge victory. I have been trying to keep a journal of sorts about things I am grateful for, and to me, this dovetails nicely. So today, our celebration of life: the boys and Lorelei played nicely together most of the afternoon, and when it was time to help out and clean up in the evening, they both did so, without whining, and singing together "cleanup, cleanup, everybody everywhere, clean up, clean up, everybody does their share"…what a blessing to my overtired heart it was tonight. You think that they aren’t paying attention to the life lessons, and then they go and prove you wrong. That, my dears, is a big victory tonight. God tapped me on the shoulder and reminded me to keep on keeping on, even when I am exhausted and discouraged.